Posh striker Tom Nichols in action at Shrewsbury. Photo: Joe Dent/theposh.com. Peterborough United could have beaten Shrewsbury by a wide margin in their League One fixture at the Greeenhous Meadow Stadium tonight (September 27). This shot from Posh star Marcus Maddison struck the a Shrewsbury post. Photo: Joe Dent/theposh.com. 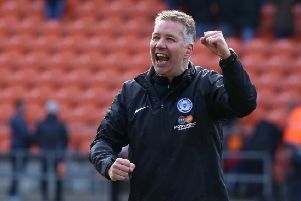 It’s a fourth draw in five matches for Posh.